Home » Blog » What is Political Sovereignty? Political sovereignty is not usually a widely and hotly debated topic. Yet the question of whether the EU undermines sovereignty dominates discussion. How do we define sovereignty and does it matter? We can get some help from past thinkers who have helped to shape our constitutional heritage. It contained such a powerful argument that Charless II ordered it to be burnt by the hangman. Rutherford was charged with treason, dismissed from his post and placed under house arrest. He only escaped execution through being seriously ill. Rutherford said that “he would willingly die on the scaffold for that book with a good conscience.” Why would he risk so much for a complex book about political government? Sovereignty is the power of government by laws. 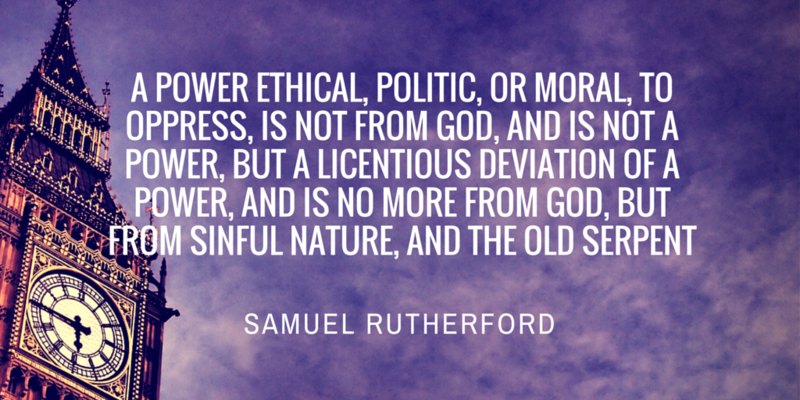 An important aspect of Rutherford’s book is that God is ultimately sovereign. “Sovereignty, and all power and virtue is in God infinitely”. True sovereignty belongs to God not man. “All civil power is immediately from God in its root”. 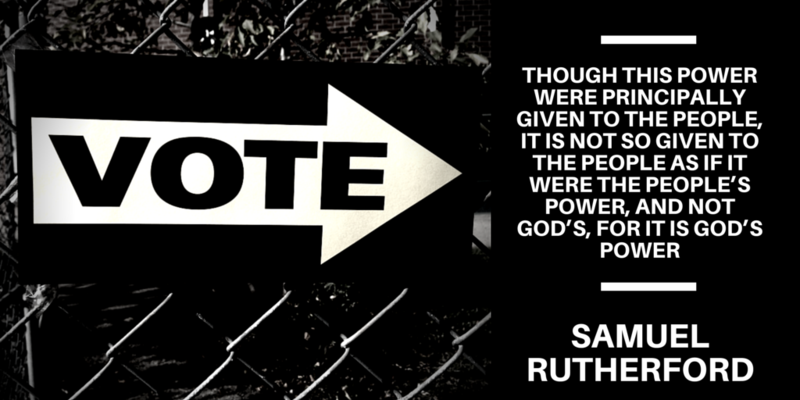 Rutherford demonstrates this from Romans 13:1 “the powers that be are ordained of God” as well as Romans 13:5 and 1 Peter 2:13. Power must be exercised to the glory of God: “all in authority…are obliged to procure that their subjects lead a quiet and peaceable life, in all godliness and honesty”. God has given this power of government (limited by His law) not to one or two but to the people as a whole “united in society”. “Though this power were principally given to the people, it is not so given to the people as if it were the people’s power, and not God’s, for it is God’s power”. The people may grant and withhold this authority to their rulers but it is limited by constitution and law not unlimited. Rulers are under the rule of law as much as anyone else. Sovereignty flows from God to the people and from them to their rulers. The people do not surrender their sovereignty to the ruler but rather delegate rule within the limits of the law and constitution. Thus, the ruler only holds power in trust for the people. They exercise it for a limited period of power and then return it to the people who exercise it once more. Rutherford argued: “It is false that the people do, or can by the law of nature, resign their whole liberty in the hand of the king. They cannot resign to others that which they have not in themselves”. Another implication of this is that rulers cannot give away sovereignty since it is not their’s to give. It can never become the exclusive possession of those who govern. This diverges starkly from the broadly secular tradition in Europe that shaped the Enlightenment. That tradition envisages every individual surrendering their sovereignty to the ruler. It can entail an almost blind obedience to the ruler. This reflected an historic over-emphasis in some parts of Europe on the “sovereignty” of the ruler. Sovereignty can be reclaimed by the people since it has only ever been lent. Intrinsic to this notion is that the people must be able to withdraw this power by exercise of the vote. This is the normal method of the people exercising their sovereignty. There must be accountability. This means an ability for the people to hold to account those who exercise power on their behalf. it is their own power in the fountain; and if they give it for their own good, they have power to judge when it is used against themselves, and for their evil, and so power to limit and resist the power that they gave. According to this view the idea of “pooling sovereignty” amongst sovereign nations is not lawful since it does not allow for full accountability. Power corrupts and absolute power corrupts absolutely. Rutherford said that power is strong wine and men are easily drunk on it. If power is abused in this way the people should recover what belongs to them. But if the king have royalty mediately, by the people’s free consent, from God, there is no reason but people give as much power, even by ounce weights, (for power is strong wine and a great mocker,) as they know a weak man’s head will bear, and no more. Power is not an immediate inheritance from heaven, but a birthright of the people borrowed from them; they may let it out for their good, and resume it when a man is drunk with it. This means that the people must have their conscience rightly informed and exercised to judge the conduct of those to whom they lend power. The people have a natural throne of policy in their conscience to give warning, and materially sentence against the king as a tyrant, and so by nature are to defend themselves. 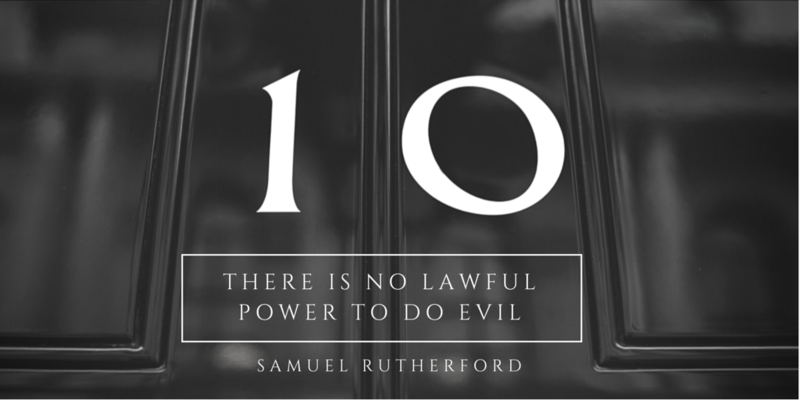 Rutherford laid down the true bounds of freedom within the rule of law. He opposed the absolute rule of men with their arbitrary unaccountable decisions. We are still in need of these priceless principles. As Rutherford concluded the preface to his treatise: “Lord establish peace and truth”. N.B. If you like the image quotes in this article, others are available here.